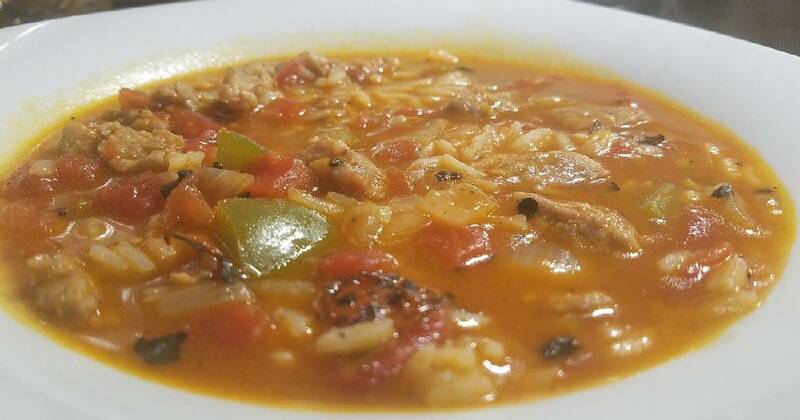 This hearty soup will warm you up on a cold day with a healthy portion of sausage, vegetables, and rice. The spices give it a nice kick without being too overwhelming, and the combination of meat, rice, and veggies make each spoonful delicious. For even more heat, try substituting hot Italian sausage or adding some red pepper flakes with the seasonings. Goes great with nice, crusty bread! Add oil to 4-quart sauce pan over medium-high heat. When oil begins to smoke, add sausage and cook until brown. Turn down to medium heat, then add onion and bell pepper. Cook for 5-7 minutes, or until onions turn light brown. Add pepper, salt, garlic powder, and cayenne. Stir to combine. Add broth, tomatoes, and bay leaf. Bring to a boil. Reduce heat and add rice. Cover saucepan and cook until rice is plump and tender, about 15-20 minutes. Remove bay leaf. Season with salt and pepper to taste.